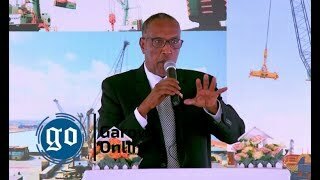 NAIROBI, Kenya - The President of Somalia's the northeastern Federal Member State of Puntland, Abdiweli Mohamed Ali "Gaas" has on Saturday arrived in Kenya’s capital, Nairobi, on an unannounced visit, Garowe Online reports. The surprise trip comes amid brewing tension in the town of Tukaraq in Sool region since it fell to the troops of the breakaway Somaliland on 8th January 2018 following an incursion against Puntland defense forces. Sources tell GO that President Ali is in Nairobi for talks with European Union officials over the resumption of the EU-funded road project in Puntland that has been suspended over widespread corruption and misuse of the funds. 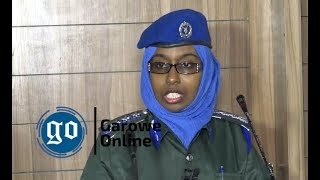 The project was aimed at rehabilitating the “Garowe-Galkayo” corridor and renovate the damaged segments of about 80Km road between Harfo and Jalam villages as well as the construction of check dams and flood control structures. 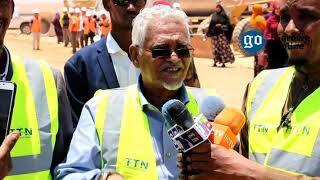 Galkayo-based Is-Xilqan construction company won the contract in 2017 after a prolonged tender process that was overshadowed by irregularities and malpractice, which later prompted GIZ to pull out its employees from Puntland. The German-based Deutsche Gesellschaft für Internationale Zusammenarbeit (GIZ) has accused the Puntland government of failing to execute the rehabilitation project as it should be, consequently, the EU has suspended the work. 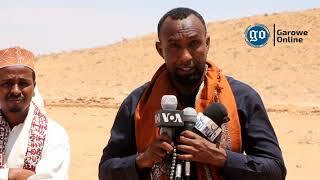 Puntland Highway Authority [PHA] and Is-Xilqan which were tasked with the implementation of the road project were reported to be involved in the corruption, which led to the suspension of the key development project in the region. Consequently, the EU has recently sent a fact-finding team to Puntland to investigate into the fraud allegations and asses situation on the ground. The investigators are expected to release a full report on their findings soon. 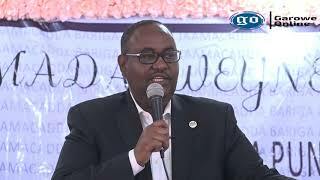 Despite this, Puntland President is trying to convince the International donors to resume the road project and pledged to deal with the corruption committed by those whom he early assigned to implement the project, including PHA officials. 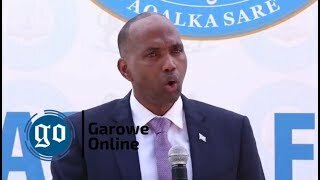 On the other hand, Somalia's International Partners are set to meet president Ali in Nairobi during his stay to put his government pressure not to launch a counter-offensive against Somaliland forces in Tukaraq, and seek a dialogue. Before his departure to Kenya, President Ali held a meeting with Puntland Vice President Abdikahim Hajji Omar (Amey) army commander and members of the civil society in Garowe, where they discussed the situation in Tukaraq. Ali is accompanied by Chief of Staff on his three-day trip to Kenya, with no members from the State cabinet, according to an official close to the President, who spoke to GO on condition of anonymity. The current government in Puntland led by President Abdiweli Mohamed Ali "Gaas" whose five-year term is ending this year has long been marred by corruption and poor transparency that badly affected the International donors financed development projects in the region.